The written test for candidates for recruitment of 346 post of Sub-Inspector (UB) in Assam Police & 27 Posts of Asstt. Jailors in Prison Department will be held on 28-023-2016 in 28 District Headquarters. The Admit Cards can be downloaded from Assam Police Website: www.assampolice.gov.in w.e.f 15.02.2016. The biometric recording will be done w.e.f. 17.02.2016. 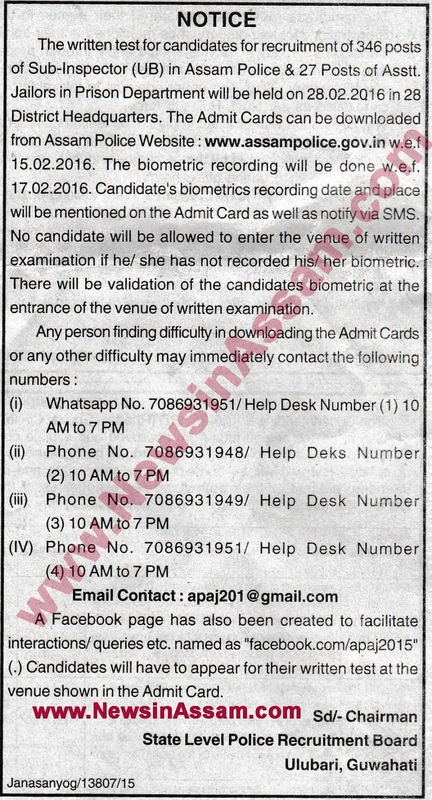 Candidate’s biometrics recording date and place will be mentioned on the Admit Card as well as notify via SMS. No candidate will be allowed to enter the venue of written examination in he/she has not recorded his/ her biometric. There will be validation of the candidates biometric at the entrance of the venue of written examination.